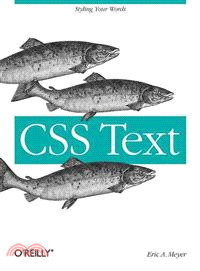 Web sites have needed text layout since the earliest days, and CSS is the smoothest way to create pleasing layouts. It's not just about choosing and applying fonts (covered in _CSS Fonts_), but about all the other features that demonstrate careful presentation. Eric A. Meyer is the author of the critically acclaimed online tutorial Introduction to HTML, as well as some other semi-popular Web pages. He is a member of the CSS&FP Working Group and the author of Cascading Style Sheets: The Definitive Guide.